Lucy Meyer is fifteen years old. At birth she suffered from lack of oxygen for 5 dramatic minutes that have taken her life on a special path as a person with an intellectual disability. Raising such a child is no easy task but Jamie Mayer, Lucy’s mother, sees life through a different type of kaleidoscope and for that Lucy (lucymeyer.org and facebook) is a medals winner in the 2014 USA Special Olympics that took place in New Jersey. 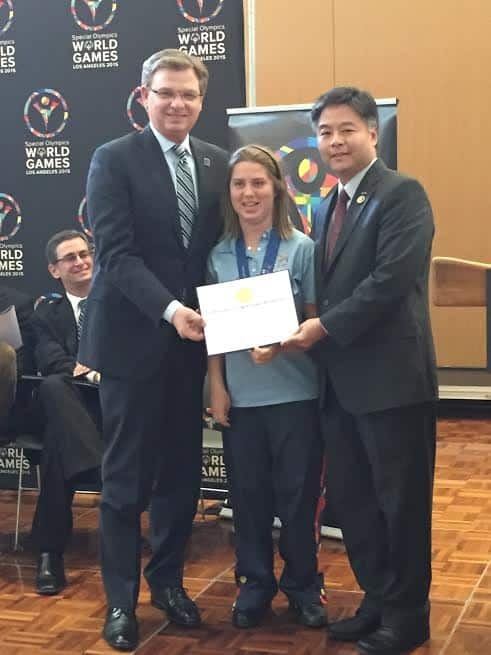 Lucy was selected as one of 52 athletes, out of 16,000 from Southern California, to compete in the USA Games as part of the Team Southern California. She won 2 gold, 1 silver and 1 bronze medal. Also she has competed and won medals in the 2013 Special Olympics, Southern California Summer Games. Last month, at Leo Baeck Temple, Los Angeles, the Santa Monica Mountains Town hosted the kick-off event for the Israeli Delegation for the Special Olympics World Games. Lucy Meyer, Special Olympics Athlete who is also the Global Messenger for the Games. People with intellectual disability are often marginalized and misunderstood. Yet, there are 4.4 million such athletes in the world who compete with courage, determination and joy. They teach us patience, how to overcome adversities and achieve inclusions. An Israeli athletes delegation to the Games, of approximately 70 members, will be hosted by the local Jewish community, led by the Santa Monica Mountains Host Town, that stood up and said, here we are (Hinenu). Last year, in Ireland, the Israeli team, of 80 members, took home 25 gold medals, 25 silver and ample bronze. The games expect to bring to Los Angeles over 7,000 athletes, from 170 countries. It will be the largest sport event since the 1984 Olympics and the largest humanitarian-sporting event in the world this year. In order to get the athletes acclimated and to give them a “taste” of Los Angeles, the athletes and their coaches will arrive on the night of July 21st and will be shuttled to different parts of the city where volunteers paid the costs to “host” them. Leo Baeck Temple is the host for the Special Olympics World Games Israeli Team. To donate by check: please make payable to “Special Olympics World Summer Games LA2015” with the “Host Town Santa Monica Mountains” in the memo line. Checks to be sent to: Laura Leventhal, Program Coordinator, Host Town Special Olympics World Games Los Angeles 2015, 633 W. 5th Street, Suite 2000, Los Angeles, CA 90071. The 2015 Special Olympics World Games open on July 25, till August 2nd, 2015, in Los Angeles. For more information, including volunteer opportunities, visit www.LA2015.org and on social media with @LA2015 and #ReachUpLA.